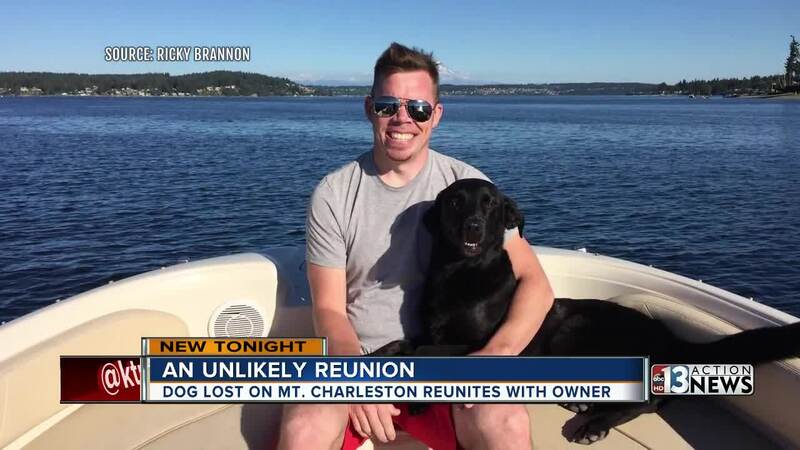 The chances of a reunion between Kona the black lab mix and her owner Ricky Brannon seemed more and more unlikely each day that passed. Brannon and Kona were hiking Mt. Charleston June 1 when Kona saw a squirrel. "She won't chase the squirrels but she's very aware of them," said Brannon. She took a few steps towards it and fell of a little cliff. "She kind of went over the edge or something," he said. "I heard the rocks kind of go and so I got up and trotted over there and I saw it was an 80-degree embankment she had gone down." Brannon did not panic right away because Kona is highly trained and comes every time she is called. But when 15 minutes went by, Brannon began worrying. "I was so frustrated that she wasn't coming to me." He searched for Kona for a few hours but ultimately wound up going home unsure if she was alive or dead. "Frustration and sadness but no, she's gonna be OK, she's a dog, she's got the instinct, she's gonna be fine." Brannon immediately posted on Facebook in a group he made called "Bring Kona Home." His original post racked up 14,000 shares. "The Facebook community went absolutely berserk about it, it was incredible." Good Samaritans took turns hiking all over Mt. Charleston to look for Kona. Complete strangers were helping Brannon any way that they could. On day five, the power of social media worked. A woman recognized Kona walking down the street on the mountain. She called Brannon. "I just immediately sat up in bed and went what?! She was like yeah you're searching for Kona right? I was like yeah! She was like we have your dog!" Brannon headed up the mountain with his dad and brother and reunited with Kona. He's so thankful for everyone's help. "I wish I could give everybody a hug," he said. "I wish I could buy everybody a beer."